(Bloomberg Opinion) -- The Federal Reserve this week effectively acknowledged that its final interest-rate hike of 2018 was an error. In trying to fix that error, policy makers have quickly shifted gears from forestalling inflationary pressures to supporting inflation and extending the expansion. The implication for market participants is to expect that the next Fed move is much more likely to be down than up. The December rate increase always seemed more model-driven than reality-based. At the time, the downturn in the financial markets had gone on too long and too deep to be easily ignored while the inflation numbers weren’t strong enough to demand the Fed’s attention. Worsening market conditions coupled with a more evident slowing in economic activity forced Chairman Jerome Powell and his colleagues to adopt a “patient” policy stance in January. 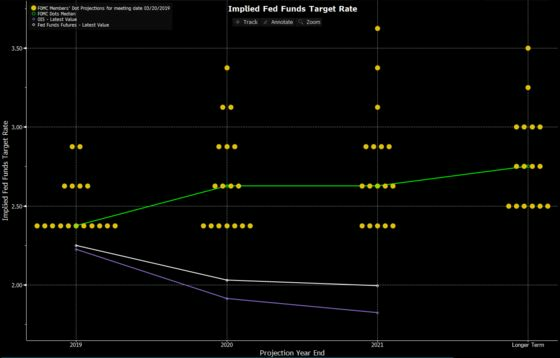 This week the Fed went one step further by cementing that patience in its rate forecasts. Eleven of the seventeen members of the Federal Open Market Committee now anticipate no rate hikes in 2019. Even more dovish were the 2020 and 2021 forecasts, which no longer anticipate that containing inflation requires restrictive monetary policy. The Fed apparently has finally realized that persistent low inflation remains a problem. In the push for higher interest rates, the Fed seemed to have lost sight of the policy challenge they still face years after the end of the recession. That challenge arises because the close proximity of rates to the zero lower bound leaves the Fed with comparatively little room to respond to a full-blown recession. Weak inflation complicates this asymmetry because it leaves real rates still high even if the Fed pushes nominal rates to zero. To avoid the problems of the zero lower bound for as long as possible, the Fed needs to ensure that inflation stays sufficiently high to hold expectations at its target and that they act to avoid a recession. The policy implication is that they need to err on the dovish side. The December rate hike was an error on the hawkish side. They now realize that error and have set the stage to err in the other direction. In practical terms, this means that a rate hike would require an actual and persistent upward spike of inflation rather than just a forecast of higher inflation as a result of inaction. In other words, the Fed now actually needs to see inflation that could become destabilizing. That is a sharply higher bar for a rate hike than we have seen so far in this rate hike cycle. On the other hand, a Fed concerned that inflation mired below target will erode inflation expectations at a time when the zero lower bound remains a policy challenge will tend toward additional policy easing should the outlook deteriorate further. Note that at this point the Fed has eased policy essentially as much as possible via lowering the expected path of rates. The next step is an actual rate cut. I suspect that not much deterioration in the outlook will be needed to force the Fed’s hand. The Fed projects growth this year to be 2.1 percent, just a notch above the longer-run estimate of 1.9 percent. If the growth outlook slips again, I expect the Fed will cut rates as an insurance policy.